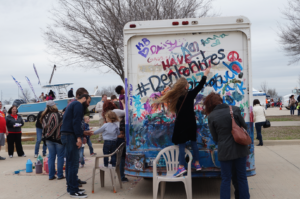 What an amazing turn out we had at Explorium Denton’s third annual Touch a Truck event! Children and adults of all ages had a blast climbing onto all sorts of different vehicles. 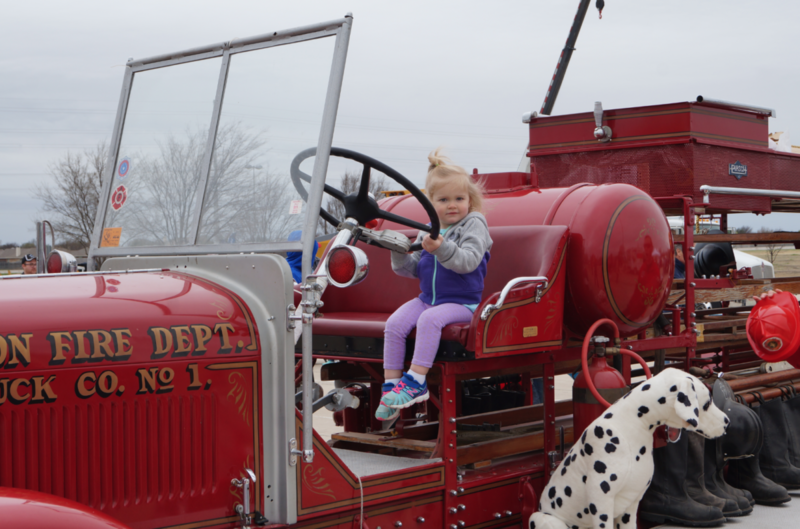 We had some new vehicles this year, including a fishing boat, a 6197 military helicopter and Denton County’s very first fire truck! It was a great day filled with kids smiling and exploring. There was a soft opening between 9:00am to 10:00am for families with special needs children where they could explore all the vehicles and activities without any engines on, flashing lights or horn honking. Later that morning families started to come in and get in lines to see all the amazing vehicles we had in store for them. The past two years we’ve had an instructional helicopter and this year we were so excited to bring a military helicopter that was actually flown during the Vietnam War! 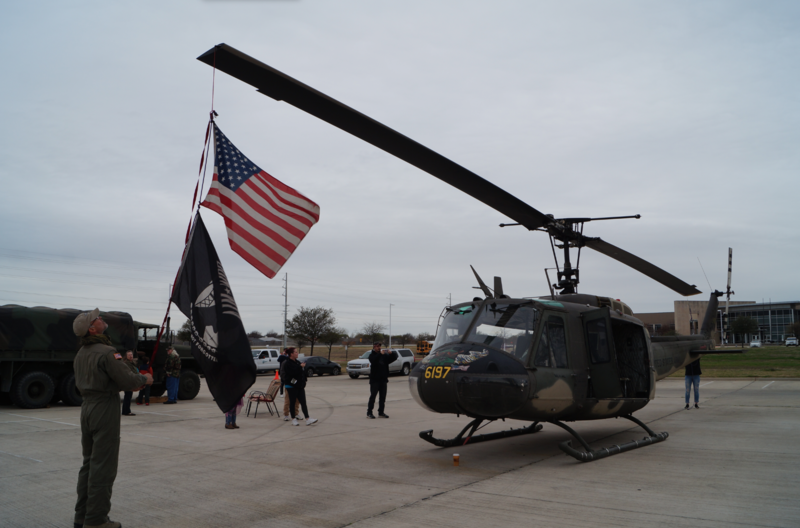 There was a huge line for the military helicopter, stretching from the entrance all the way to the other end of the parking lot. 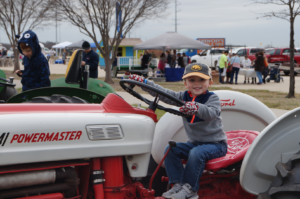 We loved seeing parents, grandparents, and kids with their happy faces as they enjoyed climbing onto tractors, military vehicles, construction vehicles, police cars, old and new fire trucks, a fishing boat and 4-wheelers. Kids of all ages were so excited to paint Frenchy’s truck and it turned out beautifully! This year we had a playing area with Imagination Playground’s Big Blue Blocks. Explorium was able to obtain this exhibit thanks to a grant from Denton Benefit League. 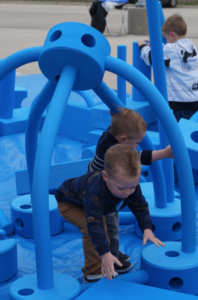 All the kids loved exploring and building with these blue blocks. Kids had so much fun building their amazing structures that even their parents started building with them! We also had a sitting area where people enjoyed the food provided by this year’s food trucks: Beware of Dog, Fire in The Hole, Kona Ice, and Combs Coffee. Everyone loved the complimentary hot dogs provided by CoServ. 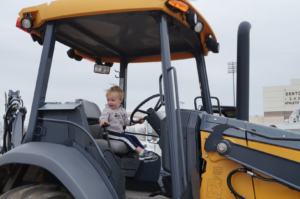 Our mission with Touch a Truck is to provide an opportunity to expose children of all ages to career paths and lifelong hobbies, as well as for smaller children to explore and learn using all their senses. As always, we are happy to accept donations online or via mail any time. 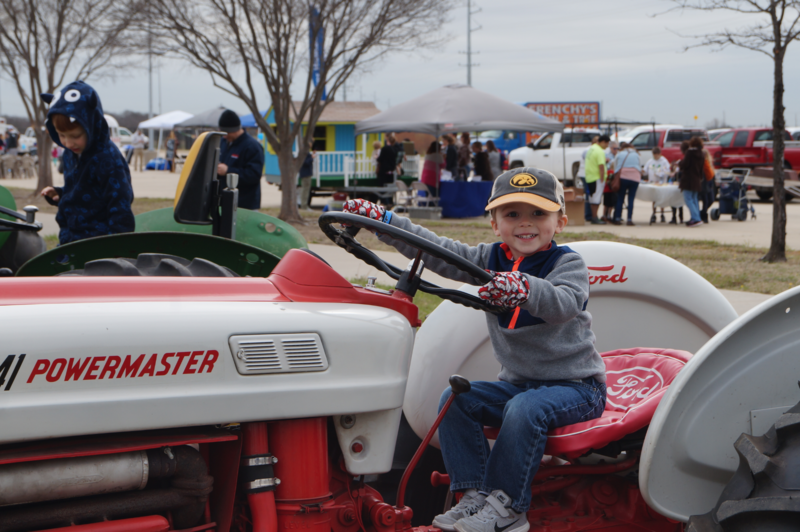 Thanks to the 3,000 people who came out to support this year’s Touch a Truck. We raised almost $8,000 for Explorium and we couldn’t be happier with this year’s outcome. We will be making a $750 donation to the Denton Public School Foundation as part of our partnership with them. Also, thank you to our board, staff and volunteers who worked so hard to make this event possible. Without the help of over 100 volunteers we never could have pulled off such a great event. See you next year at our 4th Annual Touch a Truck!